I've always been fond of this photograph of H.P. 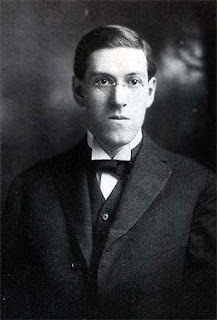 Lovecraft, which was taken of him sometime in his twenties (I can't recall ever seeing an exact age or date attached to it -- someone can correct me if I'm mistaken in this). The primary reason I like it is that it reminds us that HPL was not always "the Old Gent." "Grandpa Theobald" didn't begin his life as a gaunt, middle-aged man. Perhaps that's a small thing of which to be reminded, but I think doing so can serve a valuable purpose, especially today, on the 122nd anniversary of Lovecraft's birth. Like so many cultural icons, I think it's all too easy to forget that Lovecraft was a human being before he became a geek totem. He was born into a particular family at a particular place and time and he lived a life apart from his having been one of the supremely influential writers of the 20th century. Too often, I feel, HPL the Man is forgotten in favor of HPL the Legend and, while I, of all people, certainly don't object to the lionization of Lovecraft, we must never lose sight of the person behind the writing. He had his virtues and his flaws, like all men do, and they both contributed to making him the writer that he was, a writer who continues to fascinate and frustrate more than a century after his birth. That's probably why, as I get older, I find myself reading and re-reading books about Lovecraft's life as much as books containing Lovecraft's stories. It's also probably Lovecraft's letters hold so much interest; even moreso than his stories, his correspondence opens windows into the man, warts and all. None of this is meant to deny the lasting interest and power of Lovecraft's literary output, but I thought today, when so many of us will take a moment to praise HPL as the creator of the Cthulhu Mythos and the father of modern horror, it'd be appropriate to remember him as more than that: a human being. I remember learning I shared my birthday with the old gentleman from Providence and thinking simultaneously it was kind of cool and kind of creepy. I need to read more of his letters. I agree, from what I have read, he clearly was more than the mere HPL myth. Well put. Slightly related, just Sunday I was at a local bookstore looking for some R. E. Howard goodness, and I started browsing a book on the shelf, "Conan's Brethren" about the other R. E. Howard characters. The thing that struck me most, was the introduction, written by Howard himself, where he speaks about Picts and his fascination with them from a very young age. It was this glimpse into his tastes, and related anecdotes, which made me want to try and acquire Howard's letters. It mixes in interview segments with people like Gaiman & Del Toro that are interesting in their own right. Is that a lidless, unblinking eye of unknowable cosmic horror behind him? To say he had his flaws is an understatement. If the letters he supposedly wrote regarding his experience in New York are genuine, he was staggeringly bigoted. Can anyone on this blog contest Lovecraft's racism? I don't anyone denies that Lovecraft was, even by the standards of his own day, a bigot. No one denies those letters are bigoted. On the other hand, those attitudes were not unusual for the 1920s, when racial theories were still viewed with respect in many quarters (the most prestigious American universities followed racial quotas with little comment). It is also worth noting his attitudes became noticeably more modern in the 1930s. James has posted before on Lovecraft and I never mentioned Lovecraft's bigotry. This is because the previous posts pertained to Lovecraft as an author or a gaming influence; his racism didn't seem relevant. But this post is about Lovecraft as a human being, which means his racism IS relevant. If you haven't read any excerpts from his letters it may seem like I'm making too much of this, but he went well beyond the kind of prejudiced remarks associated with, say, Archie Bunker. He would have hated me without even knowing me, simply because of my ethnic background. He would have hated Mr. Maliszewski and probably most of the other people on this blog for the same reason. Go ahead and enjoy his stories, but don't celebrate him as a human being without at least acknowledging his pernicious beliefs. Have you seen The Strange Case of Howard Phillips Lovecraft? It's a made for TV biopic-meets-documentary with a very peculiar, personal view of HPL and his work. In many ways, Lovecraft is an invention. His legend is indredible: a solitary man, obsesed with old cults, very racist and misogynist. But it's not real because he was very a sociable man and travelled to meet many pen pals, never belived in his cults and gods, had a wife (right, his marriage didn't last... how many last these days?) and spoke bad words about inmigrants (something that many people do nowadays) but never did anything against them. He was a geek in some ways... but he never was the dark writer some people said. People always mention Red Hook as an example of his racism infiltrating his writing, but have people forgotten the story "He" ? The sanity blasting horror is that while glimpsing into the future he sees the world is run by Asians. Seriously, that is the "terrible future" meant to inspire fear in the reader.